FAQ: Do you sell motorized blinds and shades in New Brunswick? We sell motorized blinds and shades all across Canada, including New Brunswick: Saint John, Moncton, Fredericton, Bathurst, Edmundston, Campbellton, Oromocto, Grand Falls, Woodstock, Shediac, Caraquet, Saint Stephen, Dalhousie, Sussex, Sackville, etc. If you don't like complicated systems, you can start with our very simple radio controlled motors and hand held remotes, with the assurance that your system can be expanded to meet any future needs. They are very simple to install and operate, and many of our customers find that it's all they need! But, we have "Future Proofed" our RollerTrol Blind and Shade Products! If you later decide to expand your system, we have created an easy pathway that uses your existing equipment, preserving your investment. 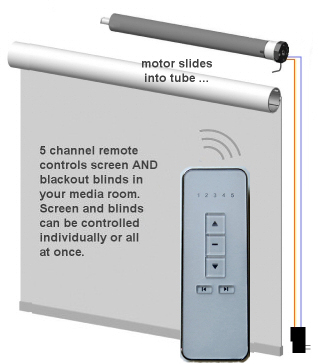 Please read this to find out how to control our blind & shade motors with a pc, tablet, or phone.